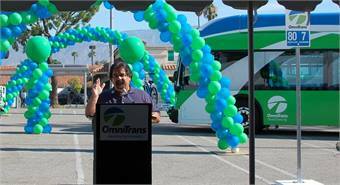 Milo Victoria was named GM/CEO of the San Bernardino, Calif.-based Omnitrans in January 2010. Previously the assistant GM, bus service, for the Washington Metropolitan Area Transit Authority (WMATA) in Washington, D. C., Victoria directed day-to-day operations of its fleet of 1,500 buses, serving more than 360 bus routes and more than 12,000 bus stops across 1,500 square miles. Established in 1976, Omnitrans carries approximately 15 million passengers each year throughout its 480-square-mile service area, covering 15 cities and portions of the unincorporated areas of San Bernardino County. Omnitrans recently rebranded. Could you discuss a little about what went behind that decision and what the agency hopes to accomplish? Omnitrans’ new look and logo are a reflection of renewal and growth of our agency. In addition to the fact that our former logo has been in place since 1985, our new logo is simpler, cleaner and contemporary. The circular shape and white T intersection in the logo design represent the ‘O’ and ‘T’ of Omnitrans. The ‘T’ also represents the roadways we follow in delivering our service to the community. The logo colors symbolize our green earth and blue sky, reflecting Omnitrans’ commitment to the environment and air quality in particular with our 100% natural gas-powered fleet. The rollout of our new logo and fleet graphics illustrates Omnitrans’ dedication to fiscal responsibility. The launch was planned to coincide with the delivery of 20 new buses, so we were able to incorporate the new design at very little extra cost. Further, we have decided go with a simplified color refresh of our existing fleet, rather than completely revamping all of our buses with the new design, to significantly reduce costs. Updates of other agency identity items, including our 2,500 bus stop signs, will be rolled out over the course of this fiscal year. We hope that our bold new design will generate a new awareness of Omnitrans and, ultimately, attract new riders to our award-winning transit agency. But, I have to say that my favorite part of Omnitrans’ new look is our tagline: ‘Connecting our Community.’ As we went through this process, discussing different options, this immediately resonated with me as the key to what we do. At its essence, this is our function: to connect all members of the community — from students, to mothers, to commuters, to persons with disabilities and senior citizens — with the places they need to go to live their lives as they choose. 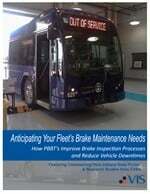 Your nearly 16-mile sbX BRT system is set to launch in January 2014. How important will that new line be for the customers you serve? When the first sbX corridor opens for passenger service in early 2014, not only will it provide a valuable service to our existing customers who rely on Omnitrans local Route 2 to get to businesses, medical facilities and school campuses, we think it will cater to a new group of passengers who realize the new service is sleek, state of the art, comfortable, faster and more frequent than fixed-route service, and more time competitive with automobile commutes. Our initial ridership projection for the sbX E Street line is 5,600 average weekday boardings, which is about 35 percent higher than the current local route delivers. We are confident that number will steadily grow, based on the successes of other BRT projects. Even with the support of the city and nearby partners, how difficult is it to scrap for funds and complete projects such as sbX as well as projects planned down the road? In contrast with the old ‘design and defend’ model of project delivery, when good planning comes first, investment and implementation will follow. Anyone who is asked to invest their precious dollars into a project —taxpayers, federal and state agencies, foundations, developers and financiers — will want to know what return they will get on their investment. This includes not only financial return, but the economic, social and environmental benefits to the community. It takes a lot of consensus building amongst all the community stakeholders to decide how to deliver projects in the most cost-effective way to bring the best value for the community. At Omnitrans, we engage with community stakeholders throughout every step of the process. Each project ultimately is not Omnitrans’ project, but the community’s project. Omnitrans is a partner bringing resources, technical expertise and innovation to the table to meet the community’s goals. We facilitate dialogues between engineers, land use planners, developers, business owners, community advocates and other stakeholders to ensure a project is providing value to the entire community.